Concept, design and layout of both publications. Came up with magazine title, mastheads and over all look and feel. Art direct photography. Design and layout over all look and feel of magazines. Magazine for modern quilter. Full of patterns contributed by various designers in the industry. Creative director for over all look and feel. Design, art direct and layout magazine. 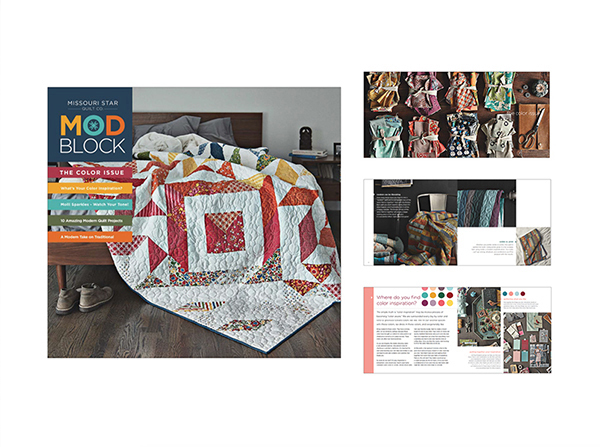 Quarterly Publication features modern quilt designs as curated art. Logo design of mast head and shortened CQ icon. Designed content, art directed imagery, overall look and feel of journal. A series of travel post cards designed for Missouri Star Quilt Co. to have in their main shop for customers traveling to this destination. Seeing Stripes came from a lot of different places, including my 80s teenage years mixed in with some childhood storybook illustration references. When I sketched this design out initially, my mind went to the outside art of the "It's a Small World" ride at Disneyland designed by Marc Davis. I'm not a huge Disney fan but I've always loved the shapes of the facade and its quilt-like aspects. Of course, there are also the stripes. I can't seem to get enough of these lately. In my fabrics, in my clothes, in my work... everything stripes. Thus the title. This quilt was designed for the MQG Block of the Month. You can find this pattern available for free in the member section of the MQG website. This quilt started as part of a guild Gee’s Bend challenge based off of different quilt blocks using improv. I couldn’t stop creating these fun pluses and ended up with a full quilt! I gave this one away as a baby gift. This quilt was part of a challenge I did with Amy Ellis with the 100 days of Improv that Sherri Lynn Wood instigated. It was such a fun learning process for me. I went through so many stages of design. Each day it changed depending on my color choice and mood. I only made it through 50 of the days but I'm so glad I did. It helped me to explore more freely my use of pattern and texture and color and hone in on my design aesthetics. I have another quilt using the remaining pieces I didn't use here that I will hopefully finish soon to complement this one. Mid-Century shapes with an 80's pop of color. Funky Medina is a fun foundation paper piecing quilt. Half square triangles that add dimension. This Quadra quilt plays tricks on your eyes but really it's just using HSTs to create dimension with various subtle colors. All the colors come together to create this technicolor foundation paper piecing geometric rainbow. Rhombuses can be fun. This quilt uses a template to create the rhombus shapes and creates a playful dance on the surface of the quilt. Using the rhombus template you can create all sorts of fun shapes and patterns. Here are two pillow designs to play with in patterned or solid fabrics. City Lights quilt takes the easy of strip piecing and adds a little improv to the mix. Diamond in the Rough was featured as the Block of the Month for the MQG. It is a foundation paper piecing block that you can use to create a quilt design or make it simple and create a pillow or mini quilt with the pattern.